These guidelines are intended to help you make design decisions about your borehole installation, and give some points to bear in mind during construction. We hope that they will help you get the best performance from your Guralp Systems borehole instruments. The major factors to consider when designing a borehole installation are the same as those for a vault, namely location, coupling and stability. The instrument must be located in an environment where non-seismic noise is minimized. We recommend that boreholes are drilled to a usable depth of at least 100 m. This depth is required so that the instrument inside will not be significantly affected by noise sources at the surface. The best geographic locations differ between boreholes and surface instruments, because of the lesser effect of surface noise. Instead, the noise performance is much more dependent on geology, with the rock type at depth a critical factor. We recommend that a geological survey of the area is carried out to identify places where bedrock may be found at depth. Granite and similar hard rocks provide the best achievable noise performance. An instrument installed in a properly-cased borehole in granite will normally outperform vault installations in all but the quietest sites. If granite can be reached, consider installing both weak- and strong-motion instruments in the borehole, to provide a complete profile of seismic activity from a single location. The instrument must be securely lodged in the borehole with good coupling to the bedrock. This is often achieved by lining the borehole with a metal casing, and filling the void between the casing and the bedrock with cement. This must be done carefully to make sure the casing is well coupled to both the instrument and the ground. Thermal stability is not normally a major factor in boreholes, although convection currents in the air column do introduce noise. Some installations achieve greater thermal insulation by installing with sand backfill. Uncased boreholes are an option where the rock is hard, e.g. granite. This type offers the best potential noise performance, since the instrument is directly in contact with the bedrock. 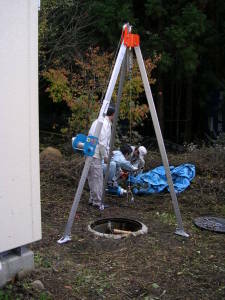 However, the rough walls can reduce the performance of the hole lock mechanism and introduce noise; it can also be difficult to recover the instrument in the event that material collapses from the upper parts of the borehole.A 6T or 40T borehole instrument can be buried in a shallow uncased borehole with sand backfill. This is a relatively simple process, but the performance of the resulting installation is reduced at long period. A cased borehole avoids the problems of loose or uneven rock surfaces by covering the sides with metal. This affords very good coupling to the borehole instrument, as well as providing a secure earthing point at the head of the borehole.With cased boreholes, it is essential that the casing is firmly attached to the bedrock at all points. This is normally done by injecting cement between the casing and the rock. If the casing is correctly installed, activity at the head of the borehole should not greatly affect the instrument (since ground motions are attenuated by transmission through the rock.) A casing partially free from the bedrock will transmit surface noise very effectively. A third option is a “half-cased” borehole. In fact this is an entirely cased borehole, but where only the section around the instrument is cased with steel—the remainder of the borehole being cased with PVC or another material. This reduces the overall cost of the installation. In some cases, instruments are installed in boreholes which already contain seismic equipment, for example in cases where the existing instrument has been concreted in to the bottom of the borehole, or where a custom hole lock has been fitted. We can supply modified sensors and hole lock mechanisms, and advise on installation techniques for this kind of situation. Contact us for more details. The inner diameter of the borehole must not be less than 16 cm throughout its length. For cased boreholes, the casing must be clean and free of residue. The borehole should be made watertight if possible. Although Guralp borehole instruments can operate whilst immersed in water, the noise performance is significantly degraded. Boreholes are normally drilled with a rotary drill. A drill type should be chosen which is capable of performing both drilling and finishing. The uncased hole should have a diameter between 21 and 26 cm. Whilst drilling is taking place, you should ensure the borehole is not drifting from vertical by continuous measurement. In addition, a complete driller’s log should be kept, showing the geological conditions the borehole passes through. Samples of drill cuttings should be taken at intervals of around 3 m and stored. The casing string should have around 17 cm inner diameter. The same weight and grade of casing should be used at all points if possible. Casing joints may be any length, but must be straight and free of irregularities to prevent the sensor or cables snagging during installation. You should record the number and depth of any joints or collars in the casing. At the bottom of the borehole, the casing string should be supported 1 m above the floor before cement is added. A mixture of cement, water, and salt is recommended to ensure the cement expands to fill any gaps. Cement should be pumped upwards from the bottom, around the outside of the casing to within 1 m of the surface. When enough cement has been added, a plug should seal the bottom of the borehole and prevent backflow. The cement should be allowed to cure for 24 hours. After curing, inspect the casing and cement. If the level of cement has dropped from the surface, more cement can be added from the top. Scrape and brush the casing, and empty the borehole of any loose material. If a test cylinder 4 m long and 16 cm in diameter can be passed freely along the whole length of the borehole, it should be straight and wide enough for the hole lock and seismometer. We also recommend that you check the borehole for leaks by filling with pressurised water. Finally, cap the borehole and cover with thermally-insulating material to minimize convection noise. At the surface, you should install a suitable small vault around the borehole head for housing the breakout box and other equipment. This vault can be covered with a concrete pad and hatch, with cables running in conduit to power supplies and communications equipment as required. It should also be checked for leaks, or include a pump system to prevent water from getting in. the 5TB strong motion accelerometer. The downhole environment is also ideal for the sensitive analogue-to-digital converters of our digitisers, as well as minimizing the length of lossy cabling. The EAM and AM are also available in downhole form, creating fully networked downhole installations. Full installation instructions are given in the documentation for the borehole sensors.